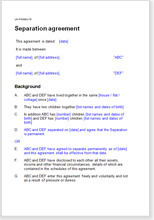 Before we tell you about this document, please note that a separation agreement is not binding in law in the same way that a commercial contract would be. A judge can still change the terms, whether your agreement is based on our template or is written for you by your attorney. We explain in more detail further down this page. Attorneys can be good negotiators and can offer good advice on entitlements, but there is nothing in a separation agreement that requires legal knowledge or an attorney. This document achieves much the same as an attorney would do for you after a few meetings. Unless you want an attorney for another reason, you can save time and money by completing this document yourself instead of asking him or her to do it for you at a high hourly cost. The agreement is straightforward and easy to complete. You don't need to involve an attorney or go to court.